This sounds like an intriguing concept! Lotte Lauv - It is a great series! I struggle with fantasy but I bet my sister would like this. Kathy - I really enjoy Cogman's series. I hope she will give them a try. 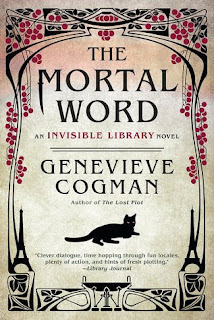 Every time you talk about The Invisible Library, it reminds me that I should read the next book in the series. Maybe one day I'll catch up to you! Loving the cover and who can resist a book featuring a librarian let alone the fae and dragons? Tracy - Irene is such a fun character. I love the world building in these books. I only just finished the Lost Plot, so I'm looking forward to this one. Jean - I hope you enjoy this one as much as I did! I am so glad you enjoyed this one, Wendy! I think that Irene and Kai were great in this one. Carole - I love both Kai and Irene. I don't read too much fantasy but your review is great! I just refound my copy of the first one and am really excited to get around to it. I'm hoping to squeeze it in this year. I'm glad you're still enjoying this series at book #5! Katherine - I hope you enjoy the series when you get to it! It looks like this series has completely passed me by, but as you say it's still strong on its fifth instalment maybe I should take a closer look. The invisible library concept is intriguing! Stephanie Jane - It's such an interesting premise--and the author has created a world in which she can go in so many different directions if she wants to. Wonderful review! Even though I don't read too many fantasy books this sounds so fun! Iliana - Thank you! This is a fun series. One of my favorites. This sounds like an interesting series, glad you are enjoying it! I still haven't read this series and I'm glad you're enjoying them.